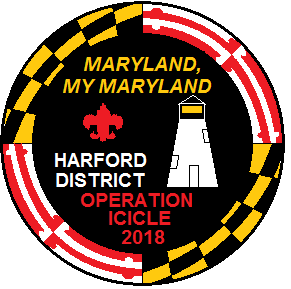 This year’s Operation Icicle celebrates Maryland, it’s landmarks, history and heritage. This year’s patch includes the Maryland flag and Concord Point Lighthouse. Thanks to the survey last year we’re bringing back scout favorites, and adding demonstration stations where scouts can learn skills and points are still earned for attending. Costs stay the same as last year (a scout is thrifty): $10 per person. Sign-ups will start at the October Roundtable and more information will be provided. We also welcome suggestions for Maryland oriented stations you’d like to see.